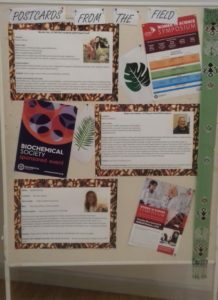 A brief review of a PhD student-lead symposium celebrating the 'Achievements of women in science and inspiring the next generation' at the Liverpool School of Tropical Medicine. Last Tuesday (May 22nd) the Liverpool School of Tropical Medicine (LSTM) held an “Achievements of women in science and inspiring the next generation” symposium. The event was organised by PhD students whose main objective was to create a platform for open discussion about barriers women face in their scientific careers; whether continuing in academia, entering industry or working in other fields, as well as their solutions. Moreover, the day offered a spotlight for leading experts, showcasing their achievements and offering the audience excellent careers advice. With over 120 attendees and 210 people live-streaming throughout the day, it turned out to be one of LSTM’s most successful events. The day was organised into three sessions: Academia, Industry and “Stomping Out Stereotypes”. Each session comprised short talks from leading experts highlighting their most notable achievements, their career paths and the barriers they’d encountered along the way. Sessions were followed by open and often frank discussions on the topics raised. Mrs Victoria Sennett (Head of EP&D and Deputy Director of HR at LSTM) opened the event by summarising the LSTM’s strategic plan to upgrade their Athena Swan institutional bronze award to silver, and the progress made by LSTM on its Athena Swan journey. Strategies included improving family friendly initiatives, mentoring schemes, enhancing information and support for promotion, revising job descriptions to facilitate equitable recruitment and promote inclusive behaviours, and encouraging personal development through the delivery of more training workshops and networking forums. In the Academia session, Prof. Sally Theobald (Chair in Social Science and International Health, LSTM) first started by enthusiastically recounting her experience at the first ‘Heroines of Health Awards’ event that was part of this year’s World Health Assembly in Geneva (May 20th) two days prior. Prof. Nynke van den Broek spoke about her work as Head of Centre for Maternal and Newborn Health (CMNH) at LSTM and the work they do in reducing maternal and neonatal morbidity and mortality. Dr Zenobia Lewis (Senior lecturer, University of Liverpool, UoL) described the pitfalls of academia including ‘Imposter syndrome’, mental health and living with fear- issues that most of the audience could relate to their careers. Prof. Sarah Cleveland from the Institute of Biodiversity Animal Health and Comparative Medicine Biodiversity (University of Glasgow) concluded the first session, speaking about her shattered dreams of Antarctic exploration, as it was historically deemed too dangerous an undertaking for women. Now working on understanding the dynamics, impact and implications of infections in tropical countries, she focused on recognising the work of the people around her who had helped her achieve an impressive list of awards during her career. The Academia talks sparked a lively panel discussion, where they were joined by LSTM’s Prof Daniela Ferreira (Head of Clinical Sciences) and Prof Hilary Ranson (Head of Vector Biology). The audience wanted to discuss unconscious bias during recruitment, the consequences of having children at different stages of the academic pathway and why the onus of solving gender inequity in the workplace seemed to be on women. This was especially highlighted by the attendance of just 7 men amongst an audience of 120 women, despite advertising heavily emphasising that the event was open to all genders. After lunch, the industry session got going with Dr Karen Whiting, the global head of new product development at BBI solutions. She touched on an interesting point about how she actively pushed back against stereotypes, making conscious efforts not to tidy up after meetings or pour the tea during meetings. Dr Sarah Rees (IVCC) supported this, stressing the unfortunate reality and importance of personal appearance in the work place. She described how she used misguided and condescending advice from employers to drive her to success. Next, Ms Felicity Thomas (Editor of European Pharmaceutical Manufacturer magazine), offered advice on moving from academia in to publishing and the importance of building transferable skills alongside formal education. Finally, a PhD student and inspiring entrepreneur from the Institute of Infection and Global Heath (UoL)- Ms Elsa Zekeng introduced her organisation Northwest Biotech Initiative (NBI). As co-founder of NBI, she described the juggling act of being a woman in business and a full-time PhD student. She encouraged fellow students to develop other skills outside of their PhD studies, be it through hobbies or more formal training opportunities and more than anything, to challenge the status quo! The following discussion panel, joined by Dr Eve Worral, Health Economist and Senior Programme Manager (LSTM), was very much focused on the development of interpersonal skills and getting recognition for the work women do outside of the job descriptions. The unique perks and pitfalls of working in industry were also discussed, as well as the characteristics needed to work in those environments. It was also emphasised how education around gender inequity starts at home and how scientific outreach and mentorship should be inclusive for boys. Following the final coffee break, the last session “Stomping out Stereotypes” kicked off with Prof Deirdre Hollingsworth, senior group leader (University of Oxford) and lead of the Neglected Tropical Disease Modelling Consortium. She offered excellent advice on working in a male dominated field drawing on her experience in the world of mathematics and again encouraging PhD students to gain skills and explore careers outside of academia. LSTM PhD students Miss Aislinn Currie-Jordan and Mrs Rachel Clare enthused about the use of drones and robots respectively in their work. They demonstrated how these cutting-edge technologies must no longer be described as “boys’ toys”. Two pre-recorded presentations followed, one from recently graduated Dr Maddie Brasier (UoL) and one from Ms Millicent Liani (LSTM). Whilst Millicent described her work identifying the barriers that women in Africa face in progressing in academic pathways, Maddie recounted her exciting experiences working in the Antarctic. It appeared that the symposium had come full circle at this point, highlighting the progression that women had made over the years- from Prof. Sarah Cleveland having been denied her dreams of Antarctic exploration, to this year when Maddie attended the all-female Homeward bound project in Antarctica. Finally, Ms Tabitha Moreton (Liverpool 2017 Mayoral candidate) offered insight on gender inequity working outside of the sciences, before the event was closed with some final words of wisdom from the LSTM’s director Prof Janet Hemingway. Prof Hemingway described how paid maternity leave had not been permitted in her day, but that she had asked anyway and was fortunate enough to be granted it. The notion of ‘if you don’t ask you don’t get’ had been reiterated throughout the day. Overall, feedback was extremely positive and requests and ideas for a similar event next year have been rolling in! Additionally, the organisers encouraged everyone to fill in ‘pledge cards’- a pledge to change their behaviour in some way, inspired by what they had learnt during symposium. Below are some of our favourite responses. What is your pledge for 2018? This symposium was funded by the Biochemical society, the National Institute for Health Research, the Health Protection Research Unit and the Institute of infection and global health (UoL) and the LSTM.